ALLEN PARK -- Jahvid Best has given the Lions explosion in the running game that no one in these parts has seen for a while. Imagine what Best could do if he was healthy. On Thursday the Lions running back was named the NFL’s rookie offensive player of the month for September. Best has been hampered by turf toe all along. First on his left big toe and now on his right big toe. He’s learning to deal with the pain. “I bet if you asked all the running backs in our league nobody is feeling 100 percent healthy right now, it’s just part of the game,’’ Best said. He didn’t practice on Wednesday or Thursday, but said there’s a good chance he’ll be able to play on Sunday in Green Bay. In three games he carried 38 times for 124 yards, caught 16 balls for 183 yards and scored the Lions’ first five touchdowns of the season (four of them rushing). Six of the last 10 seasons the Lions have gotten off to 0-3 starts. Yikes. For fans, every training camp hope springs eternal and then by October hopes of a winning season are dead. Again the Lions are 0-3. This is a different team. If all the key players could get healthy and stay healthy they could still win at least a handful of games. That’s the difference between the last two years and this season. Left guard Rob Sims, in his first season with the Lions, has a different perspective. Sims said if you’re a winning team and you miss a block, it doesn’t matter because on the next play the running back can squirt through for a touchdown. It’s different if you’ve been a team associated with losing. “You have to be perfect and we haven’t been perfect,’’ Sims said. ALLEN PARK -- Wide receiver Nate Burleson, who sprained his ankle on the first play of the game against Philadelphia 10 days ago, said he does not intend to be in street clothes on Sunday when the Lions play at Green Bay. Burleson said the swelling is down and he’s out of the orthopedic boot. He wouldn’t put a number on it, but said there’s a high percentage he will play. He’s already planning his pink attire. “It’s breast cancer awareness. Whatever pink they can give me -- my grandmother passed away from pancreatic cancer -- so as much as they can give me I’m going to go out and wear,’’ Burleson said. Coach Jim Schwartz had no update on Jahvid Best’s toe injury which kept him out of the second half in Sunday’s loss at Minneapolis. It’s the same kind of turf toe he had two weeks ago when it didn’t prevent him from playing, but on a different toe. Linebacker DeAndre Levy, playing in his first game this season because of a groin injury, wasn’t able to finish with a couple different issues. That’s as specific as Schwartz would get. 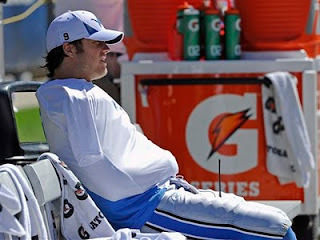 No word on the progress of Matthew Stafford who has missed two starts with a shoulder injury. MINNEAPOLIS -- Between the draft acquisition of Ndamukong Suh and the free agent signing of Kyle Vanden Bosch, the trade for defensive tackle Corey Williams is sometimes overlooked. It shouldn’t be. He’s a huge reason why the Lions defensive line is the strength of the team. Williams made a huge interception early in the 24-10 loss to the Vikings on Sunday. He couldn’t have been happier that it was a ball thrown by Brett Favre. Williams and Favre have been friends since they played together at Green Bay. They chatted on Sunday before and after the game. After Williams intercepted that Favre pass in the first quarter, Favre had a few words for his buddy. He told him he snagged a good one and joked that he didn’t think Williams had it in him. Williams returned the ball 27 yards, but was disappointed he didn’t score on the play. But the Lions did take advantage and scored a touchdown three plays later. “I wish I could have gone in there, but I didn’t. (It was) a good thing the offense got the ball and they punched it in. I think the turnaround got our momentum going,’’ Williams said. MINNEAPOLIS -- No surprises on inactives today. MLB DeAndre Levy, who was questionable will see first game action this season. With Zack Follett (concussion) and Landon Johnson (neck) out, Ashlee Palmer will start outside along with Julian Peterson. RB Kevin Smith will not play. Neither will Matthew Stafford (shoulder), Nate Burleson (ankle), G Manny Ramirez, T Jason Fox and DE Willie Young. Derrick Williams is in as a wide receiver and will serve as third quarterback if needed. MINNEAPOLIS -- Let me say that perhaps my brain has frozen after four days of being hopped up on allergy medication. But I predict the Lions will beat the Vikings on Sunday. -- In his 20-year NFL career Brett Favre has never lost a home game to the Lions. -- Favre is off to a rough start with just one touchdown pass against four interceptions in the first two games. -- The Vikings have an 0-2 start which means they’re going to be more hungry than usual . -- Detroit has not won at Minnesota since 1997. -- The Vikings are 11-point favorites. Really it doesn’t sound so promising for the 0-2 Lions. Except that they are hungry too. They are thisclose to being 2-0. Going in an 0-3 hole is not what this bunch needs. I expect Jahvid Best to have another good day now that he’s got the nerves out of the way. Shaun Hill has been just fine. He is totally prepared and knows something bout the Metrodome as a former Viking. The Lions’ defensive line has been stellar with 10 sacks and you know they will get to Favre. 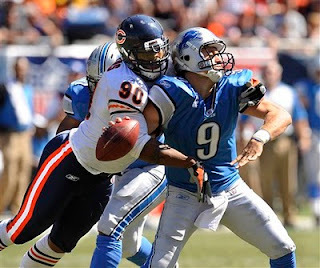 Ndamukong Suh is playing like a veteran, Kyle Vanden Bosch is a monster. If linebacker DeAndre Levy plays, he’ll help strengthen the back seven. He was listed as questionable on the injury report and is looking for his first game action this season. So I say, Lions 27, Vikings 17. Vikings quarterback Brett Favre had limited practice on Thursday due to an injuries to his ankle and right elbow. If he is healthy on Sunday when the Lions play at Minnesota, he could extend his career streak of winning every home game ever played against the Detroit Lions. If those injuries impede Favre he still has a chance to win, but obviously it would be good news for the Lions. Favre is 25-9 in his career against Detroit. The last loss to the Lions was on Sept. 11, 2005, the regular season opener for both teams. Green Bay lost that one 17-3. Seven of Favre’s losses to the Lions happened at the Silverdome. The Lions’ defense has given up too many big plays in the two losses to open the season. Favre is a big-play kind of guy. For the Lions to win there can be no miscommunication, no mistakes. In 1993, Favre’s first full season as a starter, he led Green Bay to a come-from-behind victory over Lions in the Wild Card playoffs. He threw for three touchdowns including a 40-yard bomb to Sterling Sharpe with 55 seconds left. It seems like he’s never stopped hurting the Lions. The Vikings are also 0-2 and Favre doesn’t have the receivers he had last season. Sunday will be the Lions’ chance to not only win on the road, but win against a future Hall of Famer who has always played well against them. ALLEN PARK -- Middle linebacker DeAndre Levy, who missed the first two regular season games with a groin injury, could play Sunday at Minnesota. Injuries have prevented the Lions from playing all 11 of their defensive starters at the same time, but defensive coordinator Gunther Cunningham said that tide seems to be turning. Landon Johnson filled in for Levy the first two games, but this week Johnson will likely play on the outside in place of Zack Follett who is out with a concussion. Delmas has been dealing with a groin injury since the end of June. But he said when he’s on the field he is 100 percent. This week’s injury report lists Delmas as having groin, bicep and calf injuries. Also, right guard Stephen Peterman who has not practiced this week, hopes to practice on Friday and play on Sunday. What kind of injury is it? “Whatever Jim (Schwartz) says it is,’’ Peterman said with a smile. He’s listed on the injury report with a foot injury. ALLEN PARK -- Linebacker Zack Follett (concussion), wide receiver Nate Burleson (ankle) and right guard Stephen Peterman (foot) did not practice today (Thursday). None of the three have been ruled out for Sunday at Minnesota, but it looks unlikely for all three at this point. Quarterback Matthew Stafford (shoulder) has been ruled out. He was on the practice field watching, not throwing. Back at practice were safety Louis Delmas who missed Wednesday’s practice, linebacker DeAndre Levy, and defensive end Cliff Avril. ALLEN PARK -- Starting linebacker Zack Follett is dealing with his first concussion. It could keep him out of Sunday’s game at Minnesota. He could not practice on Wednesday. In fact, he can’t work out until he passes a test that proves he is OK. He was injured playing special teams on a kickoff Sunday against the Eagles. After the hit it appeared that he staggered on the field. But coach Jim Schwartz said Follett stumbles on the field routinely. When he came out of the game, he was given a test on the bench to see if he could resume playing. “They were giving me concussion tests, kind of asking me questions, what the score was, counting backward, days of the week. I was passing all of them. I felt the second half I was out there in a dream. I was able to play and get through it. But was after the game when the headaches set in,’’ Follett said. Schwartz said they will not rush Follett’s return. “No. 1, you’re going to err on the side of caution with it. You never want to put guys out if they’re exhibiting symptoms and signs. That’s probably about it,’’ Schwartz said. Follett took a test on Tuesday and “didn’t do so hot.” It’s a computerized test that is timed. Players take one before the start of the season to determine a base-line time. ALLEN PARK -- Coach Jim Schwartz announced today (Wednesday) that Shaun Hill will get the start on Sunday at Minnesota. Schwartz said Matthew Stafford is doing “very well” in his rehab for his injured throwing shoulder. But obviously not well enough to get consideration for Sunday at the Metrodome. Hill will practice with the starters all week just like he did last week. “It’s always going to help when you’re working with the unit that you’re going to be playing with. It seemed like a crisp, sharp practice today,’’ said Scott Linehan, the offensive coordinator. Hill was 25 of 45 for 335 yards with two touchdowns and two interceptions against the Eagles on Sunday. When asked how much mobility he has, Stafford held his right arm straight up in the air briefly. He watched the loss to the Eagles with the coaches on the press box level and didn’t have much to say about the view. ALLEN PARK -- Five starters did not participate in practice today (Wednesday). Quarterback Matthew Stafford was on the field, but not throwing. He’s not expected to play this Sunday. We could get an update from Jim Schwartz after practice. Shaun Hill could be announced as the starter. Safety Louis Delmas was out too. Last week Delmas didn’t practice on Wednesday and played on Sunday. 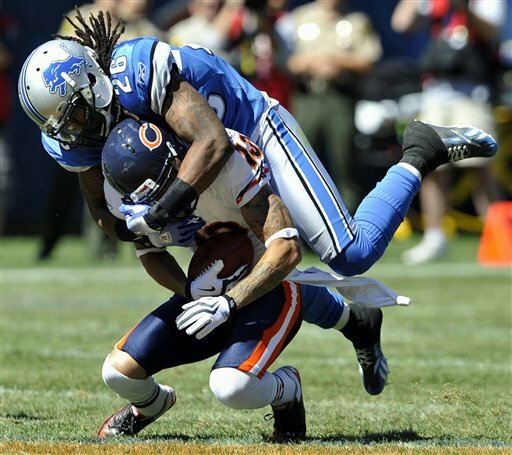 But in the Lions’ loss on Sunday Delmas came off the field more than once limping, yet he went back in. So it’s unknown if taking today off is the plan or if his groin is worse. Also missing were wide receiver Nate Burleson (ankle), linebacker Zack Follett and right guard Stephen Peterman. Follett took a big hit while on special teams on Sunday and appeared to be groggy but went back in the game. Peterman appeared to injure a knee in the loss on Sunday. On Monday, Burleson said his ankle sprain would be reassessed today. Also C Cody Wallace was signed to the practice squad while CB Jonathan Hefney was released from the practice squad. ALLEN PARK -- Even though Brett Favre arrived late at Minnesota Vikings’ training camp, coach Brad Childress is not using that as an excuse for the Vikings’ 0-2 start. “You can’t throw everything at his feet,’’ Childress said in a conference call today (Wednesday). The Lions (0-2) play at Minnesota on Sunday. Childress is 7-1 against the Lions. The 40-year-old quarterback has thrown one touchdown pass and four interceptions in the first two games, losses to New Orleans and Miami. 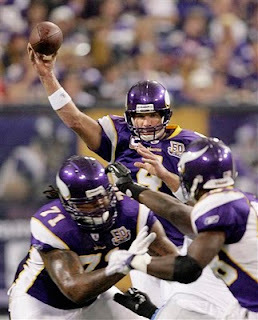 In the 2009 season Favre went 10 straight games without an interception, with the Vikings going 9-1 in that stretch. It was a team record surpassing Daunte Culpepper’s eight straight without an interception in 2004. In Favre’s career he’s thrown 57 touchdowns and been intercepted 37 times in 34 games against the Lions. -- Get the ball to Calvin Johnson. -- But don’t forget Jahvid Best. -- Pressure Brett Favre early and often. -- Pay no attention to the wacko Vikings fans and the ultra-noisy Metrodome. -- Go to work, no miscommunication, no mistakes. Sounds like a sneaker commercial. It should be the plan for the Lions. This is a game they can win. Yes, it’s on the road, but these are not the same old Lions. This is a bunch of guys who should refuse to see the start of the season spiral down the drain. I don’t think that losing would be acceptable to the captains -- Kyle Vanden Bosch, Dominic Raiola, Matthew Stafford and Jason Hanson. Or anyone else on the roster. ALLEN PARK -- You’ve heard it for years, the Lions need more consistency. Well, here’s a new dilemma that just might be correctable. In the first two games the Lions have been outscored 24-0 in the four minutes just before the end of the first half. In comparison they have outscored opponents 46-30 in the other 55 minutes of action. In the opener at Chicago it appeared the Lions might take a 14-3 lead into the locker room at the half, but the Bears scored on an 89-yard pass and a 31-yard field goal in the final 1:03 of the first half. The Eagles scored two touchdowns in the final 3:53 of the first half. ALLEN PARK -- Lions coach Jim Schwartz doesn’t want to ever give the opponent any edge, so he won’t announce injury situations unless he is forced. That means we know nothing about Matthew Stafford’s status for Sunday. Schwartz said on Monday he would address it more on Wednesday. He was also non-committal on the ankle injury of Nate Burleson. Stafford injured his throwing shoulder in the first half of the opener at Chicago. It is reportedly separated, but not in a sling. He watched Sunday’s game at Ford Field from the coaches’ box on the press box level. Burleson said he will continue to get treatment and his ankle will be assessed on Wednesday. Follow me on Twitter @PaulaPasche. DETROIT -- Already the Lions fans love Ndamukong Suh. When the rookie defensive tackle is involved in a play, the fans at Ford Field are yelling his name. Well, his last name. They appreciate good defense when they see it. On Sunday it was in the 35-32 loss to the Philadelphia Eagles. In his second NFL game, Suh led the Lions with eight tackles, six of them solo. He also registered a sack which accounted for a seven-yard loss in the loss to Philadelphia. Suh became the first Lions rookie to record sacks in the first two games of the season since sacks became an official statistic in 1983. Suh had another first when he went in as a fullback on offense in two short yardage situations back to back in the third quarter. The Lions had third-and-one and fourth-and-one with Suh in and rookie Jahvid Best running the ball. They didn’t convert either one. DETROIT -- Linebacker DeAndre Levy, who practiced on a limited basis all week, is inactive for today’s game against the Eagles. He is coming off a groin injury and had not practiced since Aug. 28. Veteran Landon Johnson will start at middle linebacker for the second straight week. With Matthew Stafford out and Shaun Hill starting, Drew Stanton will be the second quarterback. WR Derrick Williams is listed as the third quarterback. If he enters the game in the first three quarters, then Shaun Hill or Drew Stanton would not be allowed back in the game. If he enters in the fourth quarter or overtime, Hill or Stanton would be allowed back in. Williams cannot play wide receiver. As expected DE Cliff Avril who injured his left knee and broke the pinkie finger on his right hand in the loss at Chicago is also inactive. Turk McBride will get the start in his place. DE Lawrence Jackson is active after being inactive last week. Other inactives are RB Kevin Smith, G Manny Ramirez, T Jason Fox and DE Willie Young. Inactives for Philadelphia include LB Stewart Bradley who suffered a concussion last week. Kevin Kolb, the usual starter, is listed as the third quarterback. He also had a concussion last Sunday. Is it me or is anyone else bothered by Michael Vick’s past dog-fighting felony conviction? Let’s get one thing out of the way. I’m a dog lover. 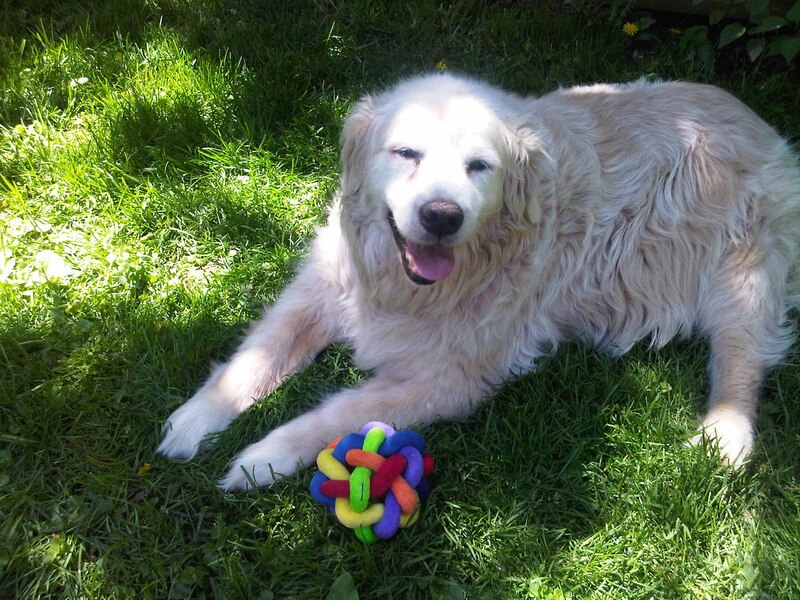 That’s Casey, my 14-year-old Golden Retriever, in the photo. He’s mostly deaf, a little goofy, quite gaseous and I love him dearly. On Sunday at Ford Field, Philadelphia’s Vick will get his first NFL start since Dec. 31, 2006. That’s because in August of 2007, he pleaded guilty to federal felony charges involving an interstate dog-fighting ring that operated for five years. Got that? Five years. Vick served 21 months in prison, followed by two months in home confinement. The Atlanta Falcons didn’t want him back after that. No one could blame them. The Eagles signed him for the 2009 season. Now he’s got the start against the Lions and it seems not much has been made of the dog-fighting conviction. His comeback is drawing national interest. The Ford Field press box will be full on Sunday and it’s not to see Shaun Hill (a dog lover) get his first start for the Lions. image-conscious NFL kicked Vick out for a while. Was it long enough? Maybe some can look past Vick’s involvement with dog fighting. I’m having trouble doing so. ALLEN PARK -- Sunday’s home opener is officially a sell-out which means the Lions’ game against the Philadelphia Eagles will be televised locally. Team president Tom Lewand said a few hundred tickets, which were turned back in by Philadelphia, are still available. “We couldn’t be more excited. This is the fans supporting us and we in turn expect to put a good product out there Sunday and make it a great atmosphere. They’re doing their part by supporting us and we’re going to do our part by playing a great game on Sunday,’’ Lewand said. He said they are very thankful for the support by the fans. Kickoff is at 1 p.m. and the game will be televised locally on WJKB-TV Fox 2. He saw a catch, just like the fans saw a catch. He did not say what the response was from the NFL. Ford, vice chairman of the Detroit Lions, said he hasn’t been able to have the same restraint as coach Jim Schwartz. He said he believes Schwartz has handled it absolutely the correct way because it’s the coach’s job to get the team focused on what they can control. The Lions will face Michael Vick and the Philadelphia Eagles in the home opener on Sunday at Ford Field. Speculation here is that if Johnson should catch a ball in the end zone on Sunday, he might hold onto it until the officials wrestle it away. ALLEN PARK -- With 2,000 tickets remaining for Sunday’s home opener at Ford Field, the Lions have received a 24-hour extension to 1 p.m. on Friday to sell out and lift the blackout. That means it’s likely the game will be televised. The NFL has never granted an extension to a team that has not sold out the game. The Lions, coming off a heartbreaking loss at Chicago, will play the Philadelphia Eagles at 1 p.m.
ALLEN PARK -- Starting linebacker DeAndre Levy was back at practice today (Thursday) for the first time since he injured his groin in a preseason game on Aug. 28. He participated in the individual drills that the media were allowed to watch. It is unknown if he went through the full practice or if he will be available to play on Sunday. Defensive end Cliff Avril, who injured his left knee and broke the pinky finger on his right hand on Sunday, did not practice for the second straight day. He was on the field watching his linemates. 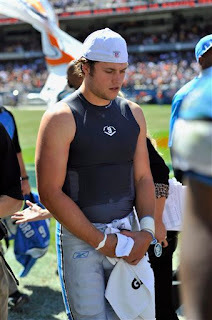 Also, quarterback Matthew Stafford, who injured his right shoulder on Sunday, did not practice but was on the field. Shaun Hill will start on Sunday against the Eagles. Safety Louis Delmas (groin) was back at practice. He missed Wednesday as part of the plan to keep his groin healthy enough so he can play on Sundays. 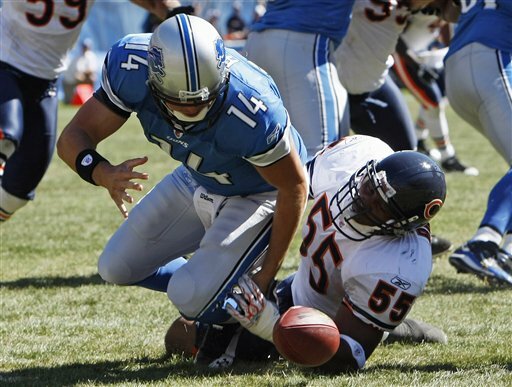 ALLEN PARK -- Shaun Hill was named the Lions’ starting quarterback for Sunday’s home opener against the Eagles. Matthew Stafford is out after sustaining a shoulder injury in the first half on Sunday. Hill is excited for the opportunity, but it doesn’t really change his preparation much. Even when he knows he will be the backup, he is meticulous about game-planning. Hill, who has a 10-6 record in NFL games that he has started, has the respect of the Lions’ coaching staff and his teammates. “Shaun is more than capable, Shaun has won, he has a high winning percentage, he’s smart, he’s fun to be around and we don’t have to alter the offense at all. We can do the same thing that we did with Matthew in there,’’ center Dominic Raiola said. ALLEN PARK -- Matthew Stafford was on the practice field today (Wednesday) but not participating following his shoulder injury on Sunday. He did not have his right arm in a sling, but looked awkward walking. DE Cliff Avril, who injured his knee and broke his right pinky finger in Sunday’s game, did not practice. Safety Louis Delmas, who played on Sunday, did not practice either. This could be a part of the plan to get him through the season with a bad groin. Immediately after the game he said his groin was fine. MLB DeAndre Levy, who hasn’t practiced since injuring his groin on Aug. 28, also did not practice. The Lions have to put the Calvin Play behind them. Here are five things they need to concentrate on this week while preparing to play the Philadelphia Eagles on Sunday. 1. Forget about it. Yes, it was a travesty. It’s over. 2. Get back to work on the run game. No team wins NFL games by rushing for 20 net yards. 3. 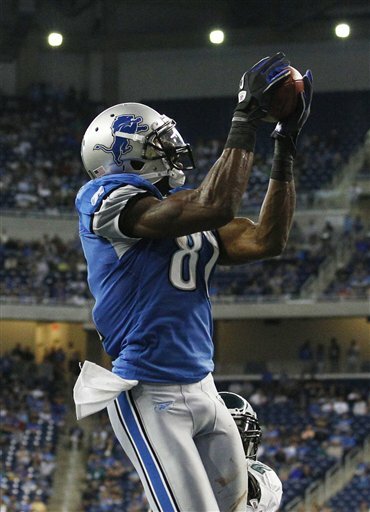 Find a way to get the ball to Calvin Johnson more often. Shaun Hill has the arm to throw a 25-yard touchdown pass, now come up with a plan. 4. The offensive line always want to keep the quarterback on his feet. Matthew Stafford will likely be out at least a few weeks. Lions can’t afford to lose Hill too. 5. Defensive line was impressive against Bears and must maintain that intensity. It appeared the Lions had made a great offseason move by signing undrafted rookie CB Aaron Berry who played at Pittsburgh. They loved his speed and intelligence. With Dave Wannstedt as his college coach, Jim Schwartz said he was prepared to step right into the NFL. He missed a few weeks of training camp with a hamstring injury, but blended in quickly when he was healthy. Then on Sunday he injured his shoulder in the loss at Chicago. Prior to the injury he had an interception which he ran back 23 yards to set up a touchdown by rookie Jahvid Best. Berry was placed on injured reserve today (Tuesday) the Lions have confirmed. That means he's out for the season. Because he was one of only four cornerbacks on the roster, the Lions signed CB Nathan Vasher who had been released by the San Diego Chargers. The 28-year-old cornerback spent six seasons (2004-2009) with the Chicago Bears where he started 46 games. 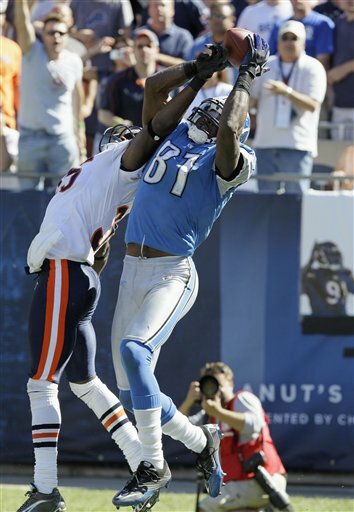 Once Calvin Johnson’s touchdown catch was ruled an incomplete pass, it seems everything else about the Lions’ 19-14 loss to the Bears on Sunday was forgotten. Make no mistake, the Calvin Play had huge implications not just for the Lions. It was another black mark on the NFL. Fans are incensed because they know the same thing could happen to their team. However, let’s move on for a minute and take another look at the Lions’ season opener. They came close to the first road win in almost three years. That pass to Calvin Johnson for the touchdown that wasn’t, was a 25-yarder from Shaun Hill. It was a great pass and shows a glimpse of what Hill has to offer. He will be playing with Stafford expected to be out for at least this Sunday and probably longer. The Lions were disappointed in the loss, but there were good signs for the rest of the season. Credit the Lions for not sulking about The Calvin Play. RB Kevin Smith said there was little talk of it in the locker room on Monday. The focus is for this Sunday when they play the Philadelphia Eagles. ALLEN PARK -- Quarterback Matthew Stafford’s injured shoulder will not require surgery according to Lions coach Jim Schwartz who addressed the issue in his Monday press conference. Stafford, who had his right throwing shoulder driven into the ground on a blind-sided hit from Chicago DE Julius Peppers in Sunday's loss, said his right shoulder is sore today. Schwartz and Stafford would not be too specific about the injury or how long he will be out of action. “No rotator cuff, no labrum, none of that stuff,’’ Stafford said. Last season he separated his left shoulder against Cleveland. “To tell you the truth I can’t really remember what it felt like the day after last year so I’m not really sure,’’ Stafford said. 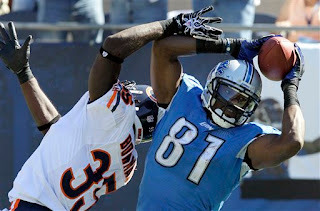 In other news, the NFL has not called to change the play that ruled the catch by Calvin Johnson was not a touchdown. CHICAGO -- This is a game the Lions should have won. It was ugly, but they held a 14-13 lead with just over three minutes remaining. Then they lost 19-14 to the Chicago Bears. 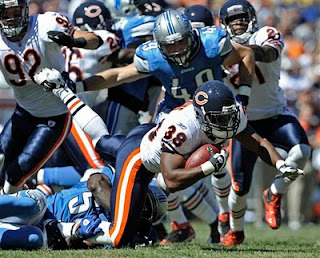 The Bears are not that good, yet they amassed 463 offensive yards against the Lions. It didn’t help that the Lions lost Matthew Stafford for the whole second half -- and maybe longer -- with a shoulder injury. But that was not the reason they lost. Shaun Hill can throw a touchdown pass. But no matter who was the quarterback the running game never got established. That’s a huge factor in the loss. The Lions had just 20 net rushing yards. The other is the Lions’ defense giving up big plays, in particular the 89-yard touchdown by Matt Forte toward the end of the first half. The defensive issue was not a huge surprise. 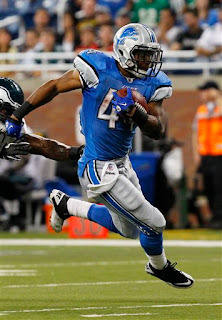 But with the talent of rookie Jahvid Best, the run game should be better. CHICAGO -- No surprises on today’s inactive list for the opener against the Bears. RB Kevin Smith, who is coming back off ACL surgery, will sit out. LB DeAndre Levy (groin) who has not practiced for a few weeks is also out. As expected, Landon Johnson will start in Levy’s spot in the middle. Others who won’t play are Derrick Williams, Manny Ramirez, Jason Fox, Willie Young and Lawrence Jackson. LB Julian Peterson will play but will wear a different number -- 98. By the way, it’s a GREAT day for football in the Windy City. It’s sunny and temp is expected to be in low 70s. Today, Sept. the 11th, is a beautiful day for football. Michigan faces a huge test at Notre Dame, Michigan State plays at Ford Field and the Lions make final preparations for a game that they have been working toward for more then eight months. It’s a great day to be a football fan, a great day to be an American. Enjoy football to its fullest, it’s the American way. At the same time we can’t forget what happened nine years ago today. 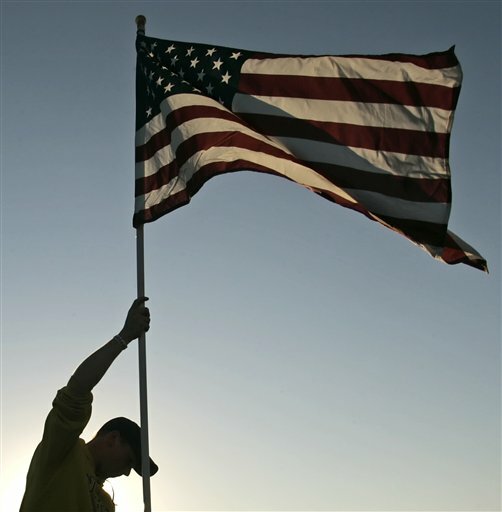 Fly your flag, bow your head, however you choose to remember. 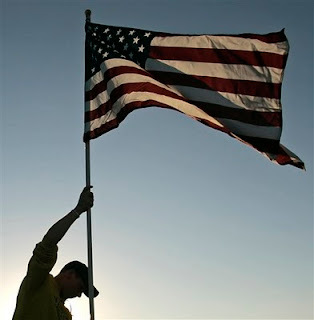 We can’t forget Sept. 11, 2001. All week I sought the answer to one question from the secondary: Are they ready? The answer was a resounding: Yes. It’s just natural to doubt that this bunch can play together as a unit and be successful especially with the Bears’ Jay Cutler quite possibly looking to go downfield for the deep ball early and often. Injuries during training camp kept the starters -- corners Chris Houston and Jonathan Wade, along with safeties Louis Delmas and C.C. Brown -- from getting much time together during preseason games or on the practice field at training camp. Well, there’s the whole gel factor and they fact they haven’t been out there as a unit. They, however, are full of confidence. Delmas said they are professionals and they will get the job done. Brown said they are good at communication when they have practiced together. They were all on the field during the OTAs and offseason work. Defensive coordinator Gunther Cunningham said the Lions are better at cornerback than they were last year, but keep in mind they were terrible last season. The starting four have a combined 112 NFL starts. Delmas is the only defensive back to return from last season. They can prove all doubters wrong on Sunday at Chicago. Then there will be no more questions. Well,naybe a couple. ALLEN PARK -- According to plan, safety Louis Delmas participated in practice today (Thursday). He was on the field for the individual drills which the media is allowed to watch. It was unsure if he went the whole practice, although he was expected to do so. Delmas, who is coming back from a groin injury, has said he definitely plans on playing in the opener at Chicago on Sunday. Middle linebacker DeAndre Levy, who also has a groin injury, did not practice. No one has ruled him out for Sunday, but it looks unlikely at this point. Landon Johnson would start in his place. ALLEN PARK -- Kevin Smith is well on his way back from ACL surgery, but there’s a chance the Lions running back will not start the season with his teammates on Sunday in Chicago. That leaves open the possibility that Smith could be inactive against the Bears. Smith has worked like a horse in his rehab from ACL surgery all during the offseason. He was on the field for minicamp in late June although not at full capacity. He also participated in training camp regularly. The plan was that he would work only one session during two-a-days and take an occasional day off. He pretty much stuck to that routine. But it is a tough injury to come back from especially for a running back. If Smith doesn’t go, you will see more of Maurice Morris, Aaron Brown and maybe Jerome Felton. Rookie Jahvid Best has earned the starting role. ALLEN PARK -- Safety Louis Delmas and linebacker DeAndre Levy were not on the practice field this morning (Wednesday) for individual drills at the start of practice. The rest of practice is not open to the media, but Delmas was not toting his helmet and Levy was nowhere in sight. Both are dealing with groin injuries. 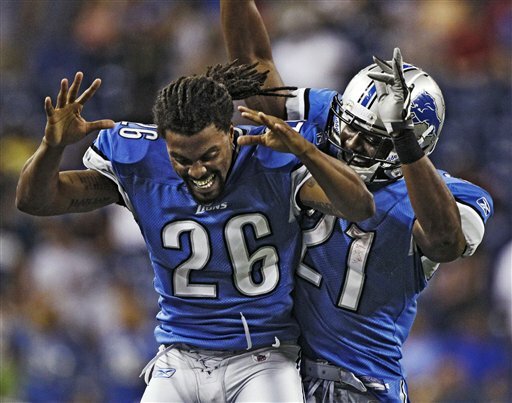 Delmas said on Monday -- without hesitation -- that he would play on Sunday in Chicago. Holding him out today could be a part of the plan. He injured his groin in the minicamp in late June and has slowly been making his way back. He played in just one preseason game. Delmas, who started 15 games last season, could play without practice. But he will be playing in a secondary that has no faces from last season and they have not had much practice time together due to injuries. Levy injured his groin on the first play of the third preseason game which was on Aug. 28. He has not practiced since. Also, on Wednesday the Lions filled their final spot on the practice squad with tight end Joe Jon Finley who played at Oklahoma and was signed last year as an undrafted free agent by San Francisco. Since the day after the 2009 season when the Lions signed Jonathan Hefney, the effort has been continual to upgrade the roster. Martin Mayhew has trashed the 2009 defense. The only defensive back from 2009 still on the roster is Louis Delmas. That includes backups. . The defensive line has been made over and there’s a new starting linebacker in Zack Follett. It’s pretty simple. Mayhew has done his part -- although don’t believe for a second that this 53-man roster is set in stone. Now he needs the players to step up starting on Sunday with the opener in Chicago. 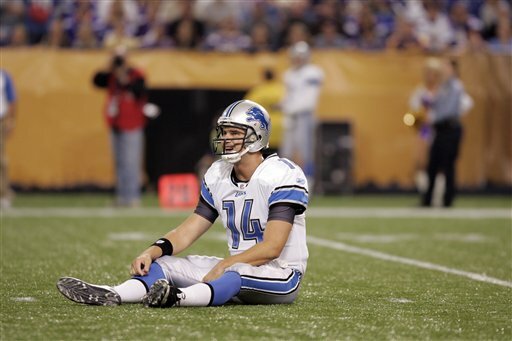 This Lions team just vaguely resembles the team that lost twice to the Bears last season. However, thanks mostly to injuries, they haven’t practiced all that much together, especially on the linebackers and the defensive backs. The offense has been revamped too, but they have been healthier throughout training camp and the offseason. “We expect to be very competitive in every game, every time we line up we expect to compete and match up which has been a problem in the past,’’ Mayhew said. The Lions ,6-point underdogs, could make a huge statement with a win at Soldier Field. Also, they could start developing a confidence that comes from playing together and winning. ALLEN PARK -- Martin Mayhew, the Lions general manager, said he wasn’t looking to make the team younger when he fine-tuned the roster and slashed it to 53. “Our list of goals, getting younger wasn’t on it. It’s always about winning football games and acquiring talent. I think we tried to do that,’’ Mayhew said on Monday. He said it was difficult to cut veterans like Jon Jansen, Dre Bly and Landon Cohen who had all had good camps. Jansen had been in a battle with Gosder Cherilus during training camp to start at right tackle. Cherilus had started there last season and had been disappointing at times. “We drafted him in the first round, he has to play at that level,’’ Mayhew said of Cherilus. Two men, two groins, two question marks. That’s the situation for Lions starters Louis Delmas and DeAndre Levy. The Lions would love nothing more than to go into Chicago next Sunday and make a statement to start the season by snapping their 20-game road losing streak. If they are to have a chance at doing so, they need Delmas and Levy to be on the field and close to 100 percent. Delmas, the starting free safety, injured his groin at the minicamp at the end of June. He was in and out of training camp -- mostly out -- trying to nurse the injury and not make it worse. He played in just one preseason game. He was expected to see time in the fourth preseason game and did not. He seems fairly upbeat about the situation, but understands the complexities of a groin injury. Levy, the starting middle linebacker, injured his groin in the first play of the third preseason game. He hasn’t practiced since and the Lions are mum on the seriousness of the injury. Although coach Jim Schwartz did admit it could keep him out of the opener. But that was a week ago and the situation could have gotten better -- or worse. While the Lions won’t release the full list of cuts until the deadline, word is leaking out. Safety Ko Simpson has been released according to ESPN’s Adam Schefter. Simpson was coming off knee surgery. He started five games for the Lions last season and was expected to be in the battle for the starting strong safety position. Also unconfirmed reports say that veteran linebacker Vinny Ciurciu has also been cut. Ciurciu who was brought in last year for special teams was expected to back up at middle linebacker when starter DeAndre Levy is out. However, in Thursday night’s game the Lions started Landon Johnson in the middle. Johnson is more valuable because he can play inside and outside. Wide receiver Tim Toone, the last player selected in April’s draft reported on his Facebook page that he had been cut. He’s a likely candidate for the practice squad. Earlier today, veteran tackle Jon Jansen and rookie middle linebacker Caleb Campbell confirmed via Twitter that they have been cut. Jansen, who grew up in Clawson, was in a battle during training camp to start at right tackle with Gosder Cherilus. Obviously the Lions have decided to go the younger route. They have liked Corey Hilliard in camp and they have rookie Jason Fox learning the ropes. Campbell tweeted that he was told he’ll be on the practice squad. First he has to clear waivers. The Lions can name eight to the practice squad at noon on Saturday. Campbell, who hadn’t played football in two years because of military obligations, was making a position change from safety to linebacker. This is in no way a surprise and a good move for Campbell. NFL teams must cut to 53 players by 6 p.m. today. Veteran tackle Jon Jansen and rookie middle linebacker Caleb Campbell have confirmed via Twitter that they have been cut by the Lions today. The roster must be cut to 53 by 6 p.m.
Campbell tweeted that he was told he’ll be on the practice squad. First he has to clear waivers. The Lions can name eight to the practice squad at noon on Sunday. Lions rookie defensive tackle Ndamukong Suh was fined $7,500 by the NFL for unnecessary roughness for his hit on Cleveland quarterback Jake Delhomme in Detroit’s third preseason game last Saturday. He not only grabbed Delhomme's face mask but he horse-collared him to the ground, thinking he still had possession of the football. For a player with a contract that guarantees him $40 million, it is pretty much a slap on the wrist. Coach Jim Schwartz would not comment on the fine. As a rookie, Suh has to learn the differences between college and the NFL. Schwartz didn’t say it, but he’s not going to be too concerned about a rookie who is too aggressive. The coaches are more likely to be concerned that the penalty cost them 15 yards. ALLEN PARK -- Here’s the news from the press conference of Jim Schwartz at lunchtime on Friday: Defensive end Korey Bosworth broke his leg in Thursday night’s win over the Bills. Bosworth, the nephew of Brian Bosworth, had to be carted off the field. He was a long shot to make the 53-man roster anyway. Schwartz did not want to tip his hat on any specific players or even position groups with the roster cut to 53 due at 6 p.m. on Saturday. ”We have certain agendas with players, some of which we’re very optimistic about, we’d like to find a way for them on the football team. Others maybe we’re trying to find a spot for, whether it’s trading or something else,’’ Schwartz said. Schwartz did admit that the cut to 53 will be tougher than it was a year ago. That’s a good sign that this team has a more talented roster. Delmas doesn’t need the preseason play. But the Lions’ secondary desperately needs him to be healthy in the regular season. Coach Jim Schwartz said he expects Delmas to be ready for the opener on Sept. 12 at Chicago. “I think we’re pretty confident he’ll be back out there,’’ Schwartz said. 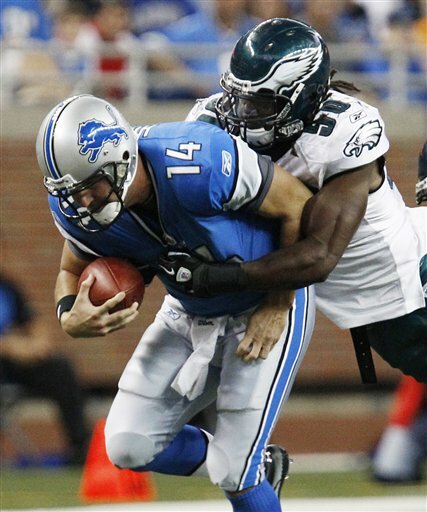 As for Thursday night, Schwartz said Delmas was not 100 percent. “It didn’t make a whole lot of sense to put somebody out there when we got the Chicago game coming up and I wanted guys 100 percent going into the Chicago game. So anybody that was nursing something, we just decided it was better not to even have them out there,’’ Schwartz said. That also included Jahvid Best, Corey Williams and Jeff Backus. Schwartz was not specific about their injuries. Backus was not on the sidelines and Schwartz said he was excused from the game. It possibly had to do with the fact his wife is due with their second child. While it’s unclear how long the starters will play tonight in the Lions’ final preseason game against the Bills, expect to see plenty of Aaron Berry, an undrafted rookie cornerback. The Lions considered Berry a possible starter until he injured a hamstring on Aug. 6 and was held out of practice. He’s healthy and was back at practice this week. This will be his first preseason action. “He’s had a good offseason and a good camp. The thing that upset me is he got injured because another guy made a mistake. ... But I need to see him play and we all do, he’s done some good things at camp,’’ Lions defensive coordinator Gunther Cunningham said. Berry, who played at Pittsburgh, went undrafted despite his speed. He ran a 4.3 40 at the Pitt pro day. If the Lions start Chris Houston and Jonathan Wade at cornerback, Berry could fit in as a backup along with Dre Bly, with Eric King at nickel back. Rocky Boiman a savior? Yes, sort of. He can play middle linebacker and he knows the Lions system. That's all it takes. The Lions situation at linebacker has been hurting since training camp started because of injuries. First starting middle linebacker DeAndre Levy was out with a bad back. Then his replacement, Jordon Dizon, was injured in the preseason opening game at Pittsburgh and lost for the season. Levy was back at practice last week, then injured his groin in the first play of Saturday’s preseason win over the Browns. It’s a possibility he could miss the regular season opener on Sept. 12 at Chicago. While Vinny Ciurciu is likely to start at middle linebacker in Thursday’s final preseason game, expect Boiman to play even though he just signed on Monday. “That’s the plan, we didn’t bring him in to stand around. That’s part of the reason he’s the guy we brought in ... He’s a guy who can get up to speed really quickly,’’ coach Jim Schwartz said. Boiman spent four years with the Tennessee Titans when Schwartz was the defensive coordinator there. Also at the same time Lions defensive coordinator Gunther Cunningham, was the assistant head coach/linebackers for the Titans. The Lions run a similar system so Boiman should fit right in. Boiman can also play on the outside, but at least for this game they need him in the middle.